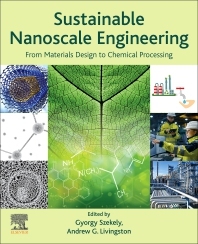 Sustainable Nanoscale Engineering: From Materials Design to Chemical Processing presents the latest on the design of nanoscale materials and their applications in sustainable chemical production processes. The newest achievements of materials science, in particular nanomaterials, opened new opportunities for chemical engineers to design more efficient, safe, compact and environmentally benign processes. These materials include metal-organic frameworks, graphene, membranes, imprinted polymers, polymers of intrinsic microporosity, nanoparticles, and nanofilms, to name a few. Topics discussed include gas separation, CO2 sequestration, continuous processes, waste valorization, catalytic processes, bioengineering, pharmaceutical manufacturing, supercritical CO2 technology, sustainable energy, molecular imprinting, graphene, nature inspired chemical engineering, desalination, and more. Gyorgy Szekely received his MSc degree in Chemical Engineering from the Technical University of Budapest, Hungary, and he earned his PhD degree in Chemistry under Marie Curie Actions from the Technical University of Dortmund, Germany. He worked as an Early Stage Researcher in the pharmaceutical research and development centre of Hovione PharmaScience Ltd in Portugal and as an IAESTE fellow at the University of Tokyo. He was a visiting researcher at Biotage MIP Technologies AB in Sweden. Gyorgy was a Postdoctoral Research Associate in Imperial College London. Gyorgy was appointed a Lecturer in Chemical Engineering at The University of Manchester between 2014 and 2018, and received the Distinguished Visiting Fellowship of the Royal Academy of Engineering. Gyorgy served as an Adjunct Faculty at Saveetha University between 2016 and 2018. He is currently an Assistant Professor in Chemical Engineering at the Advanced Membranes & Porous Materials Center at King Abdullah University of Science and Technology (KAUST), and a Visiting Academic at The University of Manchester. His multidisciplinary professional background covers molecular imprinting, nanofiltration, and green process engineering. He serves as an Academic Editor for the journals Advances in Polymer Technology, Advanced Materials Letters, and Current Nanomaterials. He is a Member of the Royal Society of Chemistry, and a Fellow of the Higher Education Academy. Gyorgy has been designing novel materials and processes for molecular level separations which resulted in several articles, industrial research, consultancy works, and patents. Andrew Livingston studied Chemical Engineering in New Zealand. Following graduation, he worked for 3 years at an NZ food processing company doing general chemical engineering. In 1986, he started his PhD at Trinity College, University of Cambridge. Upon finishing his PhD in 1990, he joined the Department of Chemical Engineering at Imperial College. At Imperial, he has carried out research into membrane separations, biotransformations, chemical, and separations technology. He leads a research group of 20 PhD students and PostDocs, with current research interests in membranes and processes for molecular separations. Andrew was made full Professor in 1999, has published over 200 papers, and been granted 15 patents in chemical technology. His awards include Junior Moulton Medal, Cremer and Warner Medal of IChemE, and Silver Medal of Royal Academy of Engineering. He was elected a Fellow of the Royal Academy of Engineering in 2006, and became Head of the Department of Chemical Engineering at Imperial College in 2008. In 1993, Andrew graduated with an MSc in Economics from London School of Economics (LSE) following part-time study. In 1996, he founded Membrane Extraction Technology, a spin-out company, which evolved to manufacture solvent stable nanofiltration membranes, and carry out process development and commercialization of OSN-based membrane separation processes. On 1 March 2010, MET was acquired by Evonik Industries of Essen, Germany, and continues in business as Evonik MET Ltd., a part of the Evonik Fibers and Membranes Business.